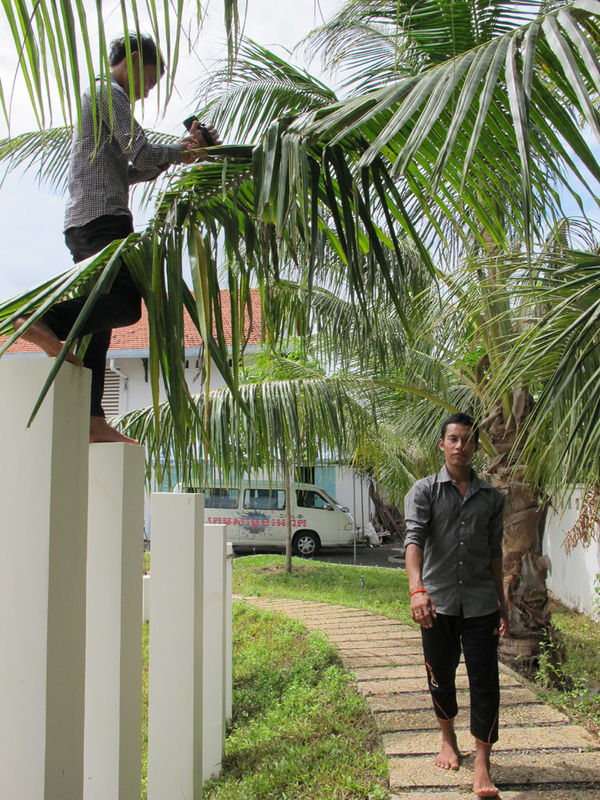 KAMPOT, Cambodia, 16th June 2015: Someone is balanced atop a pillar, with their video camera poking out between palm branches. Another young person sprawls out on the floor, to get their lens as close as possible to the ground. 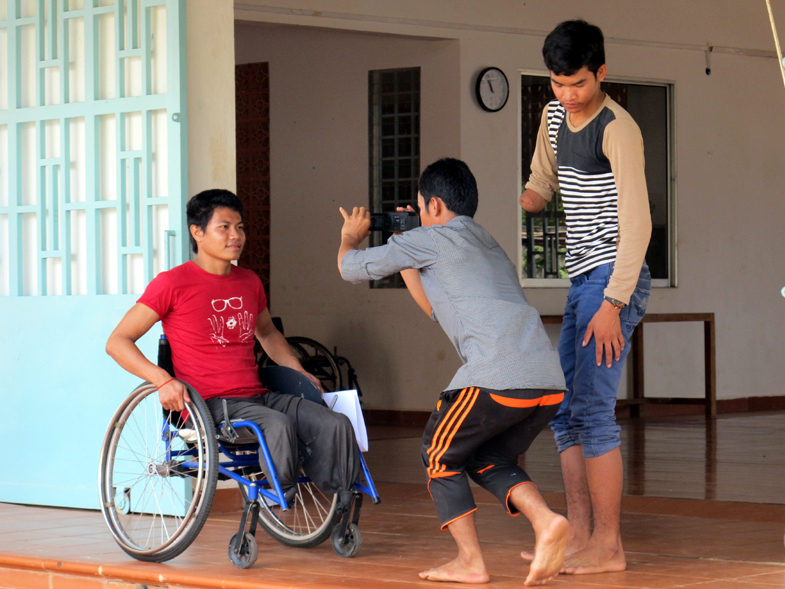 A group of three deaf students discuss their next shot using Cambodian Sign Language (CSL). The Epic Arts Centre is a hive of creative activity today, as the students learn film making skills for the One Minutes Junior project. One Minutes Junior is a creative five-day UNICEF workshop, where young people have the opportunity to express themselves by creating their own short film. Every student learns the basics of film making - from storyboarding their initial idea right through to editing the final film. All of the participants are students at Epic Arts, an inclusive arts organization that is a partner of UNICEF Cambodia. Epic Arts uses arts as the basis of projects to develop confidence and self-esteem, encourage independence and provide an accessible pathway for education. Saron’s diverse group show fantastic teamwork as they each take turns to direct, film and act. 23-year-old Socheat, who uses a wheelchair, explains further. “When we film we have some challenges. But we discuss it together and find solutions.” Socheat is very comfortable in the director role, encouraging his team mates and lining up the shot. He alternates between Khmer and sign language as another of his team members is deaf. 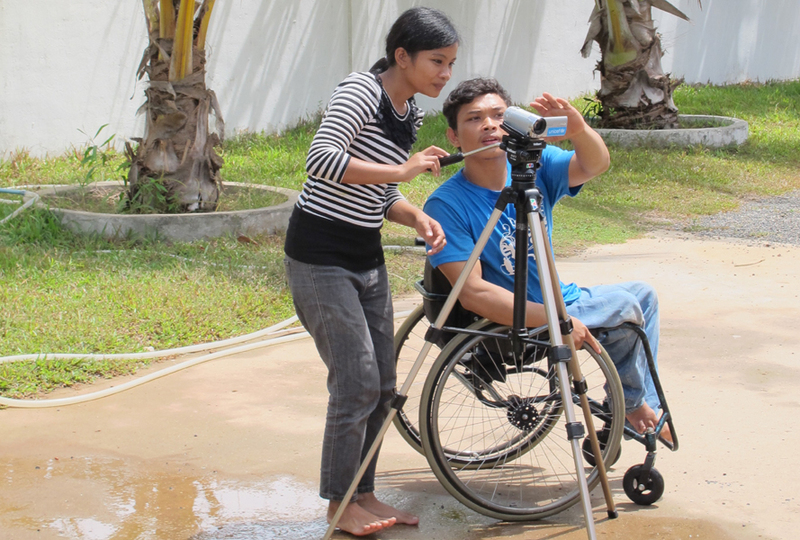 As they use a tripod to shoot a creative scene using one of the centre’s accessibility ramps, there is no doubt that their filming skills are improving rapidly. By the end of the workshop every student will have developed, filmed and edited their own film. They each choose a topic that is important to them and create a movie that is exactly one minute long. Today each student has refined their idea and learned how to use a camera. The excitement is already building for tomorrow, when they will start to make their very own films.